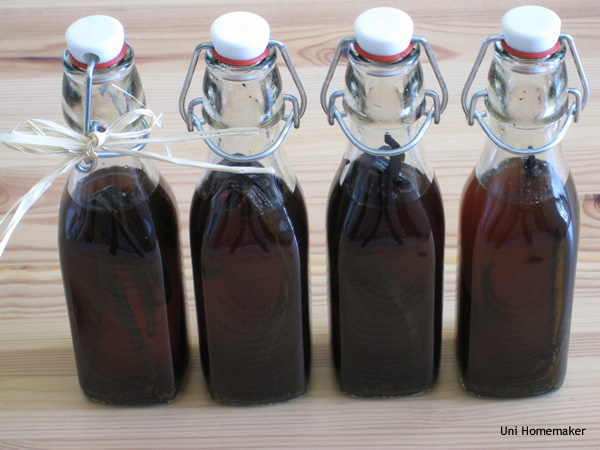 About a month ago, I made my own vanilla extract using different spirit variations. I wanted to see how each vanilla extract would render. Since there weren’t any well spirits in my house, I decided to use the stuff I had on hand. Here’s what I had: Grey Goose Vodka, Bacardi Rum, Captain Morgan Spiced Rum, and Don Julio Blanco Tequila. The photo above is at 33 days of aging. 1 more month to go! Split your vanilla beans open and scrape the seeds out. Place the vanilla seeds and the pods in your jar or bottle. Add your spirit of choice. Store in a cool dark place for 2 months or longer. I stored mine in a brown grocery bag sitting in my closet. Shake it every now and then. Which was your favorite liquor? I find myself constantly reaching for the spiced rum one. I’ve been baking a lot lately with cinnamon and nutmeg and the vanilla extract infused with spiced rum is wonderful with it. Looks great- can’t wait to do this. I got a bag of organic vanilla beans in India for only $10 & I tried once before to make extract but I didn’t cut them open & the flavor was weak. Now I know to scrape the seeds out of the pods! thanks! Thanks! If you are making this as a gift, you might not want to scrape the seeds out as it can make the extract look cloudy. I scraped only because I’m making it for my own use. Most people don’t bother with this step. The secret to having a flavorful extract is to let it sit for as long as you can. 2 months is at least the very minimum. Have fun with your extract! What an awesome idea! I love baking with liquor and using vanilla steeped in the same liquor makes perfect sense. Thank you for visiting my post, as it introduced me to your wonderful blog. I love Uni sushi by the way and that was the first thing that came into my mind when I saw the name. Funny that your name came from it. Thank you. And thanks for popping over! Love this idea Anne! Which one is your favorite? Would make great gifts!